Dutchess Hotel & Restaurant opened in 2011 by the Dutch couple Heleen Meijer and Michel Kroon. Combining their love for good natural food and making cheese made them fulfil their dream to open Dutchess . 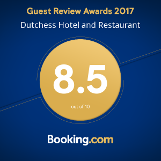 With their eye for detail and transferring their high standards into Dutchess, Heleen and Michel made Dutchess what it is today: A relaxing, quiet boutique Hotel with well equipped rooms and a Restaurant that is able to compete with the best in the country. With Dutchess getting more and more successful Heleen and Michel decided to share the work with, Christian Dudek, who is responsible of the day to day business and the host for their clients. With Christians experience in the upscale German hotel sector he and his trained staff strive to make your visit as pleasant as possible. Supporting the local environment is one main aspects of the Hotel & Restaurant. All food supplies are bought locally and if some ingredients are not available Heleen, Michel and Christian trained their staff to produce it themselves. Starting from the home-made dairy products (yoghurt, fresh and cream cheese, double cream) all the way to bread, ice cream, pesto and jam. In this way the Dutchess exposes their chefs to new tastes and techniques while the local ingredients stimulates the economy to allow for more development in the region. Heleen, Michel and Christian invite you to enjoy their gem in the heart of Africa and look forward to your visit!